On October 3rd come to The California Academy of Science's Nightlife event for their annual tribute to sharks. 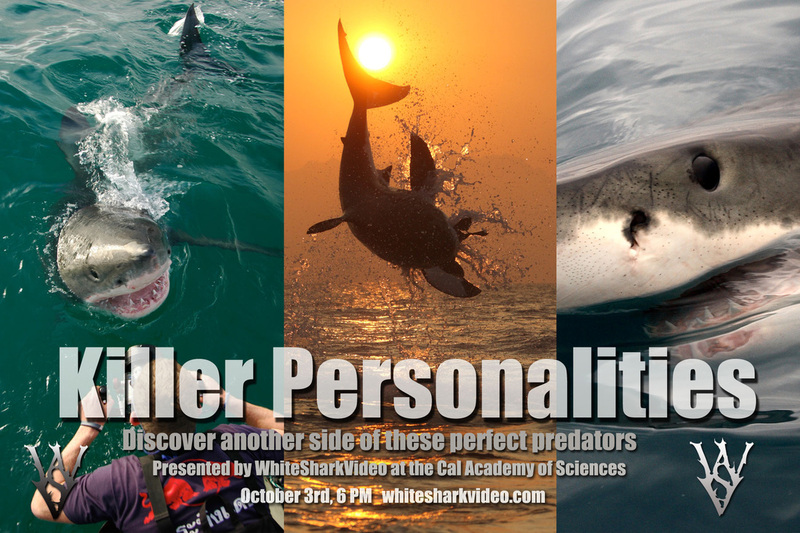 White Shark Video will have its own gallery featuring world class shark photographers from around the world. The theme of my gallery this year is "Killer Personalities", featuring photos that show this animal behaving in a way that will cause you to question whether its just a killer or if it possesses an individual personality. All the academy's exhibits will still be available to guests with the bonus of several shark specific displays. Make sure to stop by my gallery. James Moskito, of Great White Adventures will be on hand to answer questions about his photos from 6:30 to 7:00. Of course, I'll be on hand as well. Read more here. Stay calm and give me your money! The Teaser Trailer for The Price of Existence has been released online and can be seen here. White Shark Video's Indiegogo fundraiser will launch on Monday, September 30th. Start spreading the word and donate if you can! You get a tax write off for it! Help celebrate WSV becoming an official nonprofit company and the public premiere of the trailer to the company's first full feature film. A signed, limited edition, certified print from wildlife photographer, Amos Nachoum. The "shark girls" will be on hand to accept optional tax deductible donations for anyone feeling like giving. In return for any donation of $25 and up you'll receive one signature drink from the bar, access to hors d'eourves, and one raffle entry. Or just hang out and enjoy. More event details here.